Permissionless Innovation: Book, Video, Slides, Podcast, Paper & More! I am pleased to announce the release of the second edition of my book, Permissionless Innovation: The Continuing Case for Comprehensive Technological Freedom. As with the first edition, the book represents a short manifesto that condenses — and attempts to make more accessible — arguments that I have developed in various law review articles, working papers, and blog posts over the past few years. The book attempts to accomplish two major goals. First, I attempt to show how the central fault line in almost all modern technology policy debates revolves around “the permission question,” which asks: Must the creators of new technologies seek the blessing of public officials before they develop and deploy their innovations? How that question is answered depends on the disposition one adopts toward new inventions. Two conflicting attitudes are evident. One disposition is known as the “precautionary principle.” Generally speaking, it refers to the belief that new innovations should be curtailed or disallowed until their developers can prove that they will not cause any harms to individuals, groups, specific entities, cultural norms, or various existing laws, norms, or traditions. The other vision can be labeled “permissionless innovation.” It refers to the notion that experimentation with new technologies and business models should generally be permitted by default. Unless a compelling case can be made that a new invention will bring serious harm to society, innovation should be allowed to continue unabated and problems, if they develop at all, can be addressed later. I argue that we are witnessing a grand clash of visions between these two mindsets today in almost all major technology policy discussions today. The second major objective of the book, as is made clear by the title, is to make a forceful case in favor of the latter disposition of “permissionless innovation.” I argue that policymakers should unapologetically embrace and defend the permissionless innovation ethos — not just for the Internet but also for all new classes of networked technologies and platforms. Some of the specific case studies discussed in the book include: the “Internet of Things” and wearable technologies, smart cars and autonomous vehicles, commercial drones, 3D printing, and various other new technologies that are just now emerging. I explain how precautionary principle thinking is increasingly creeping into policy discussions about these technologies. The urge to regulate preemptively in these sectors is driven by a variety of safety, security, and privacy concerns, which are discussed throughout the book. Many of these concerns are valid and deserve serious consideration. However, I argue that if precautionary-minded regulatory solutions are adopted in a preemptive attempt to head-off these concerns, the consequences will be profoundly deleterious. Mye central thesis is this: Living in constant fear of hypothetical worst-case scenarios — and premising public policy upon them — means that best-case scenarios will never come about. When public policy is shaped by precautionary principle reasoning, it poses a serious threat to technological progress, economic entrepreneurialism, social adaptation, and long-run prosperity. social pressure from activists, academics, and the press and the public more generally. increased transparency and awareness-building efforts to enhance consumer knowledge about how new technologies work. Such solutions are almost always superior to top-down, command-and-control regulatory edits and bureaucratic schemes of a “Mother, May I?” (i.e., permissioned) nature. The problem with “top-down” traditional regulatory systems is that they often tend to be overly-rigid, bureaucratic, inflexible, and slow to adapt to new realities. They focus on preemptive remedies that aim to predict the future, and future hypothetical problems that may not ever come about. Worse yet, administrative regulation generally preempts or prohibits the beneficial experiments that yield new and better ways of doing things. It raises the cost of starting or running a business or non-business venture, and generally discourages activities that benefit society. To the extent that other public policies are needed to guide technological developments, simple legal principles are greatly preferable to technology-specific, micro-managed regulatory regimes. Again, ex ante (preemptive and precautionary) regulation is often highly inefficient, even dangerous. To the extent that any corrective legal action is needed to address harms, ex post measures, especially via the common law (torts, class actions, etc. ), are typically superior. And the Federal Trade Commission will, of course, continue to play a backstop here by utilizing the broad consumer protection powers it possesses under Section 5 of the Federal Trade Commission Act, which prohibits “unfair or deceptive acts or practices in or affecting commerce.” In recent years, the FTC has already brought and settled many cases involving its Section 5 authority to address identity theft and data security matters. If still more is needed, enhanced disclosure and transparency requirements would certainly be superior to outright bans on new forms of experimentation or other forms of heavy-handed technological controls. In the end, however, I argue that, to the maximum extent possible, our default position toward new forms of technological innovation must remain: “innovation allowed.” That is especially the case because, more often than not, citizens find ways to adapt to technological change by employing a variety of coping mechanisms, new norms, or other creative fixes. We should have a little more faith in the ability of humanity to adapt to the challenges new innovations create for our culture and economy. We have done it countless times before. We are creative, resilient creatures. That’s why I remain so optimistic about our collective ability to confront the challenges posed by these new technologies and prosper in the process. If you’re interested in taking a look, you can find a free PDF of the book at the Mercatus Center website or you can find out how to order it from there as an eBook. Hardcopies are also available. The Mercatus Center also recently hosted a book launch party for the release of the 2nd edition. The event was very well-attended and many of those present asked me to forward along specific slides or the entire deck. So, for those who asked, or others who may be interested in seeing the slides, here ya go! Finally, I put together a paper summarizing the major policy recommendations contained in the book. 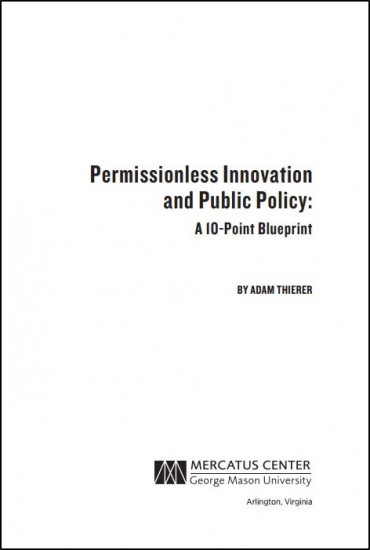 It’s entitled, “Permissionless Innovation and Public Policy: A 10-Point Blueprint.” And then, along with Michael Wilt, I published condensed version of the paper as an essay over at Medium. What Should the FTC Do about State & Local Barriers to Sharing Economy Innovation? What Does It Mean to “Have a Conversation” about a New Technology? “US Medical Devices: Choices and Consequences,” (with Richard Williams and Robert Graboyes), October 21, 2015. “How the Internet, the Sharing Economy, and Reputational Feedback Mechanisms Solve the ‘Lemons Problem,’” (with Christopher Koopman, Anne Hobson, and Chris Kuiper), May 26, 2015. “The Sharing Economy and Consumer Protection Regulation: The Case for Policy Change,” (with Christopher Koopman and Matthew Mitchell), The Journal of Business, Entrepreneurship & the Law 8, no. 2 (2015). “The Internet of Things and Wearable Technology: Addressing Privacy and Security Concerns without Derailing Innovation,” Richmond Journal of Law and Technology 21, no. 6 (2015). “Removing Roadblocks to Intelligent Vehicles and Driverless Cars,” (with Ryan Hagemann), Wake Forest Journal of Law & Policy 5, no. 2 (2015): 339–91. “Technopanics, Threat Inflation, and the Danger of an Information Technology Precautionary Principle,” Minnesota Journal of Law, Science & Technology 14 (2013): 309–86. “Privacy Law’s Precautionary Principle Problem,” Maine Law Review 66, no. 2 (2014). “The Pursuit of Privacy in a World Where Information Control Is Failing,” Harvard Journal of Law & Public Policy 36 (2013): 409–55. “A Framework for Benefit-Cost Analysis in Digital Privacy Debates,” George Mason University Law Review 20, no. 4 (Summer 2013): 1055–105. “The Case for Internet Optimism, Part 1: Saving the Net from Its Detractors,” in The Next Digital Decade: Essays on the Future of the Internet, ed. Berin Szoka and Adam Marcus (Washington, DC: Tech Freedom, 2010), 57–87. Previous post: Cable set top boxes are a distraction. The FCC is regulating apps.